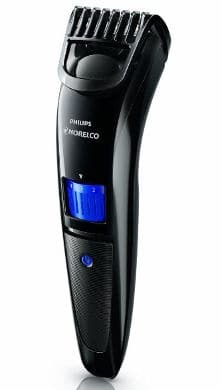 The Phillips Norelco QT 4000/42 is specifically designed to help men with beards to keep their facial hair neatly trimmed. 10 Built in length settings so that you can just dial in the length you want. Self sharpening blades are maintenance free. Rounded tips prevent skin irritation. 45 minutes use per 10 hour charge. Indicator light lets you know when the trimmer is charging. We like the fact that it has an international voltage, making it possible to use it wherever you travel. We also like the fact that it doesn’t have a lot of combs or guides to have to keep track of and clutter up your bathroom. The indicator light lets you know that the trimmer is actually charging. We also really like the fact that this device has self sharpening blades and is inexpensive enough that even if you only get 6 months of use from it, you will be getting your money’s worth. Although this product is designed specifically for beards, it can also be used for manscaping as long as you are not looking for a razor close trim. There are a few things about this trimmer that we feel they could be improved. For starters, since the battery is subject to a shortening of its life if charged before it is almost completely discharged, there should be a battery indicator light that allows you to know how much juice is left in the battery. Overall ratings and reviews are quite good. Some users do get trimmers that either wouldn’t work from the start or died shortly after purchase and others wished this trimmer would do a better job with trimming mustaches. Easy to Clean: Once users finish trimming their beard, they find this trimmer quite easy to clean simply by blowing off any hairs on the trimmer that were lose and then rinsing the head under warm water. Even Trim: Most users say that this Phillips Norelco beard trimmer provides an even trim once the length is set and locked into space. Easy to Adjust Lengths: Getting the length they wanted from this device was as easy as just dialing in the desired length. Cuts Well: Several of the users stated that this grooming tool cuts well and that it didn’t require multiple passes to get everything trimmed up neatly. There do seem to be some differences of opinion on the battery life, though. While several users feel that it has a good battery life, others found the battery only lasted a few months. Nevertheless, do keep in mind that when shopping for a trimmer, everyone is going to have a different opinion. How well a trimmer meets your specific needs is going to depend on the thickness of your beard, how close or how long your beard length is and a number of other factors. Hopefully, the information in this review will help you decide whether or not this trimmer is right for you.